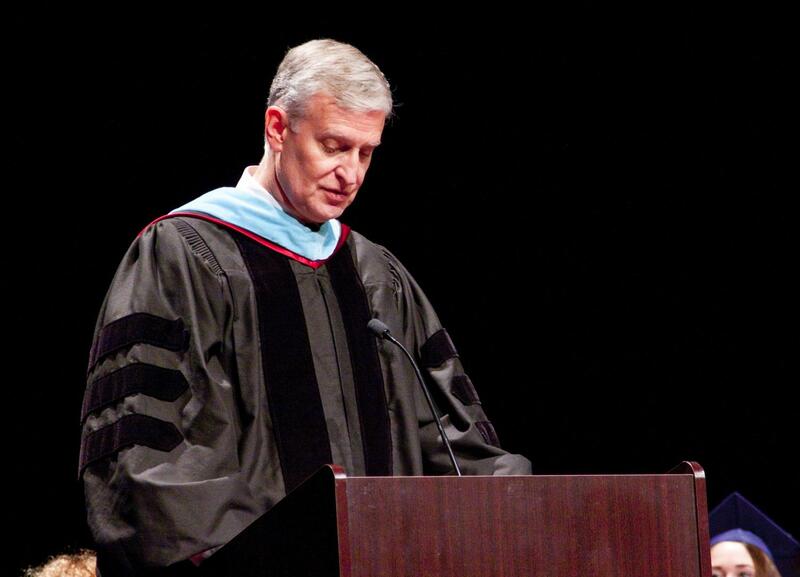 Sentimental Speech: Speaking at the 2018 graduation, Riggle reflects on his cherished memories of the graduating class. On this day, Riggle officially announced to faculty his plan to retire. Dr. Mike Riggle, Glenbrook 225 Superintendent, announced his plan to retire last June, according to Principal Dr. Lauren Fagel. The search for a new superintendent began in September and will carry onto January, says Skip Shein, president of the Glenbrook 225 Board of Education. Glenbrook 225 is working with BWP & Associates, a consulting company that assists schools in identifying candidates for leadership positions in education, to aid this process, Riggle says. On Oct. 3, a public forum was held for faculty, parent groups, students and community leaders to share the strengths in the community, areas for growth and criteria for the new superintendent, Fagel says. The Glenbrook 225 Board of Education’s main goal is to determine who the new superintendent will be, Riggle says. In addition to working with BWP & Associates, Riggle says he is assisting and supporting the process as much as he can. Having experience in education is greatly desired because it would be difficult for a superintendent to understand the needs of teachers if they have never had any experience in a classroom beforehand, according to Shein. In agreement, Fagel believes that the new superintendent should be someone who has experience and is authentic. Prior to being Glenbrook 225 Superintendent, Riggle was first a high school principal at Bloomington South High School in Bloomington, Indiana. Later, he was the principal of Glenbrook North High School for ten years, he says. The official criteria for a superintendent have been posted on the Glenbrook website. Currently, the Glenbrook Board of Education along with BWP & Associates is soliciting and receiving applications for this position since final applications are due Nov. 23, according to Shein. The Glenbrook 225 Board of Education has come across obstacles with the timing of Riggle’s announcement, as well as his anticipated absence in the Glenbrook community, Shein says. Riggle’s most noteworthy memory of being superintendent was when the Glenbrook 225 District prepared new tax referendum dollars adequately so that they would not have to ask for another referendum from the community. Although Riggle has more time to spend with his family now, Fagel says that she is sad for the district, as Riggle has left a memorable mark in the Glenbrook community. Watch for the Oracle’s profile of the life and career of Dr. Riggle in an upcoming issue.